yiannis krikis (thessaloniki, Greece) on 25 November 2009 in Architecture and Portfolio. Fantastic view. Stresses the center of the image with the cement pylon and its own shadow. A very good picture at all. I like you "see" things. You "look" of photographer! Good morning. Adela. Nice serie about colored facades. A nice and colourful picture! simple but beautiful frame . great PP . A nicely balanced composition. The blue pops. reminds me of the movie 'notting hill'... the house with the blue door :) nice shot man!!! I like these old fashion architecture, lovely composition, like the sunshine. jolies couleurs pour cette façade. 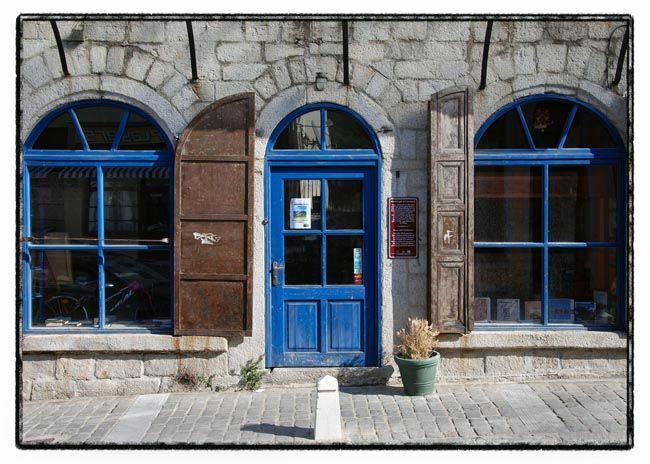 Beautiful large windows and blue door and stones. White walls, blue doors and windows. Amazing combination. I like the near-symmetry of this photo, and the repeated arched shapes across the frame. Great color, too.